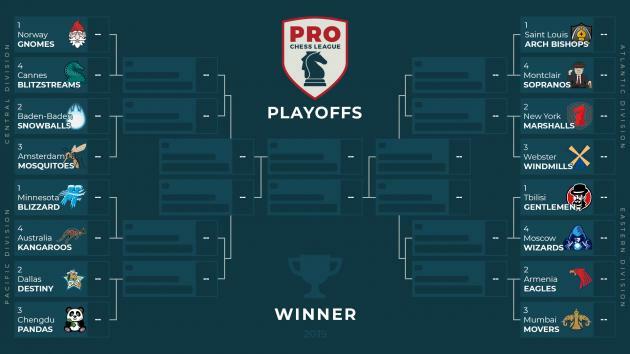 It's playoff time for the PRO Chess League, and the teams from the Atlantic and Pacific Division aim to get one step closer to the live esports final in San Francisco. Play starts Tuesday at 1:20 p.m. PDT (4:20 p.m. EDT, 8:20 p.m. GMT). The Eastern and Central divisions play on Saturday. Preview by IM Greg Shahade. After 10 weeks of exciting battles, 16 teams are left in this season's PRO Chess League. The knockout phase is starting today with the Atlantic and Pacific divisions. Starting off the day will be the Saint Louis Arch Bishops. With both Fabiano Caruana and Wesley So at the top of the lineup, they are considered the favorites to win the title. They are going against the Montclair Sopranos. Montclair made it into the playoffs by besting the Montreal Chessbrahs in the Battle Royale. Montclair will need a big performance from newly minted GM, Nico Checa. Checa won some big games in last week's Battle Royale and just won the National High School Championship this past weekend. The New York Marshalls and Webster Windmills may have the most even matchup of the first round. In our PRO Chess League fantasy contest, this matchup has proven to be a complete tossup, with 50 percent of brackets picking each team. The Marshalls were down 7-5 in their first meeting and pulled off an incredible 3.5-0.5 final round to win the match. The Windmills are sure to want revenge for that one. In New York's favor is the draw odds it retains from the better regular-season record, so if the match finishes 8-8, New York advances to the next round. The Minnesota Blizzard and Australia Kangaroos have very similar makeups, with balanced lineups full of 2400-2500 players. The Blizzard has been one of the greatest examples of the idea that a balanced lineup can work in the PRO Chess League, and the team hopes to ride this strategy to the live final. The Blizzard has been delighted with the strong play of Dutch free agent IM Thomas Beerdsen. Beerdsen has been playing above 2600 level throughout the season with an exciting attacking style of chess. The Kangaroos are copying the Blizzard this week, and the key for them should be the play of former world youth champion, FM Raymond Song. Song hasn't played chess for many years, but is back with a vengeance and has been putting up great results during the 2019 PCL season as board four for the Kangaroos. Dallas Destiny and Chengdu Pandas played in the first round of the 2018 playoffs, with the Pandas advancing on an 8-8 tie, due to holding the draw odds. The same teams meet again this year, but this time it's Dallas who will get the draw odds. Dallas is yet another balanced lineup, with its board four rated above 2400. The Destiny hope to feast on Chengdu's much lower-rated, albeit young and talented, board four, and then find a way to manage 4/12 on the top three boards. It won't be easy though, as the Pandas are fielding three 2600+ players. Watch all the PRO Chess League action on Twitch.tv/chess, Twitch.tv/prochessleague, and Chess.com/tv. The Atlantic and Pacific Divisions play on Tuesday beginning at 1:20 p.m. PDT (4:20 p.m. EDT, 8:20 p.m. GMT). The Eastern and Central Divisions will play on Saturday, March 23.